Manhattan plots of the association P values. In two major studies published in Nature Genetics today, researchers use biological understanding to dissect the genetics of diabetes. An international team comprising researchers from more than 100 institutions analysed vast suites of genetic data from more than 100,000 people of European descent to uncover the associations. In the first study, the team identified ten novel genetic markers for biological traits underlying type 2 diabetes. In a companion paper the same consortium identified three new variants that are associated with raised levels of glucose seen in a common test for type 2 diabetes. The results help to unravel the complex biological story of type 2 diabetes: as well as revealing five new associations that influence directly the risk of diabetes, this research will drive studies to understand the biology of disease and to search for treatments to alleviate the burden caused by the disease. The team are working to understand the normal metabolism of glucose as well as diseases of glucose metabolism, such as diabetes. They seek to uncover new genetic variants that are risk factors for the development of diabetes, as well as identifying genes that influence variation in the healthy range. Diabetes occurs when our bodies fail to produce sufficient insulin or when our cells fail to recognise and react to the insulin produced, resulting in abnormally high blood glucose or sugar levels. The research was done by the Meta-Analyses of Glucose and Insulin-related Traits Consortium (MAGIC) who examined several commonly used measures including levels of fasting glucose and insulin and blood sugar levels two hours after an oral sugar challenge. They searched data from population studies of people without diabetes to examine the links between glucose levels and SNPs – single letter changes in the genome that can act as markers for particular physical traits or disease. 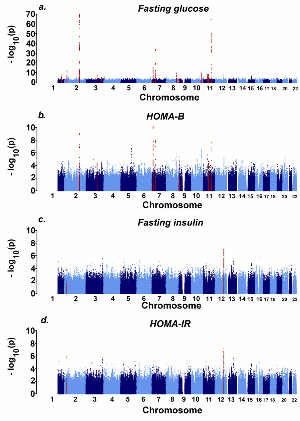 They found nine new genetic regions associated with fasting glucose, 16 regions associated with insulin production but only a single region associated with insulin resistance. The team have strong evidence that other genetic factors remain to be found: their study explains about ten per cent of the genetic effect on fasting glucose. 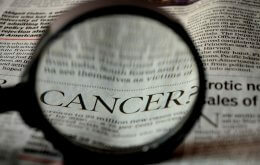 They believe that there will be rarer variants with a larger impact that would not be found by a study such as this. Many of the diabetes-risk loci had not previously been identified in case-control studies, which compare patients with apparently healthy people. The genome-wide approach used here is a valuable complementary method to find variants that influence disease risk. Importantly, the participants were apparently healthy people, rather than patients, which suggests that important genetic determinants can be found in larger groups of unaffected people, rather than the sometimes restricted groups of patients. In the detailed analysis of the glucose challenge, the team found three novel genetic associations, the most prominent of which was with a gene called GIPR-A. Normally, this gene produces a protein that is part of the normal hormone response to feeding, acting to stimulate release of insulin and thus control levels of glucose. The variant is associated with impaired response to the glucose meal and elevated levels of glucose. GIPR sits at a key decision point in glucose metabolism. The threat posed by type 2 diabetes appears to be on the rise. Estimates suggest that between 170 million and 285 million people worldwide have type 2 diabetes, The World Health Organization suggests that, without urgent action, deaths caused by diabetes could double in the next ten years. Type 2 diabetes represents 95 per cent of all diabetes cases and is defined as raised levels of glucose in the blood measured either when fasting or 2 hours after a glucose meal’ (oral glucose challenge). The characteristics of type 2 diabetes are resistance to the effects of insulin and impairment to the working of the beta cells of the pancreas that produce insulin. Type 2 diabetes is strongly associated with obesity, a history of diabetes, impaired glucose metabolism and population of origin. Type 1 diabetes is an autoimmune disease in which the body’s defences attack the insulin-producing beta-cells of the pancreas. The Medical Research Council supports the best scientific research to improve human health. Its work ranges from molecular level science to public health medicine and has led to pioneering discoveries in our understanding of the human body and the diseases which affect us all. The goal of the MRC Epidemiology Unit is to study the genetic, development and environmental determinants of obesity, diabetes and related metabolic disorders and to contribute to the scientific basis of prevention.